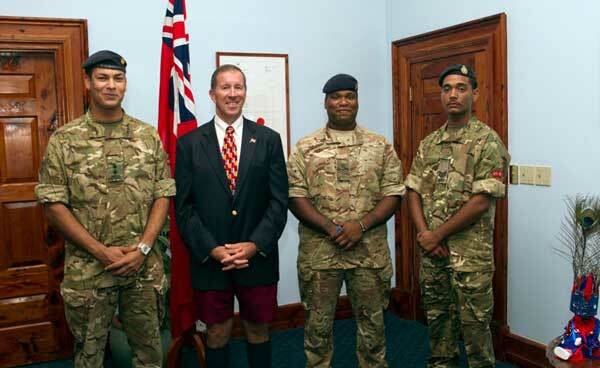 [Updated] Earlier today [Aug 29] the Premier and Minister of National Security, Michael Dunkley welcomed three members of the Bermuda Regiment to the Cabinet Office. The Officers are embarking for Kenya this weekend. Lt. Paolo Odoli, CSgt Jason Smith, and Sgt Dejion Stange will be travelling to the African nation for two months to participate in extensive tactical training, affording them the opportunity to gain first-hand real employment experience in various military roles. The Premier said of the upcoming visit, “It was a pleasure to meet these young men and to wish them well as they travel to Kenya to represent the Bermuda Regiment. Update 8.00pm: The three will leave this weekend to travel to England to meet up with the Welsh Guards Battle Group before flying to Kenya on military transport for the six-week Askari Thunder. Capt. Odoli said: “The two main advantages is that we, as commanders and part of the long-stay nucleus will get exposure to opportunities that will make us stronger commanders. “And exercises like this are a huge incentive for people to stay in the Regiment longer – this is a once-in-a-lifetime opportunity. C/Sgt Smith – who has been on exercises in Gibraltar, Germany and Morocco – said: “It will be a great experience. Regiment Commanding Officer Lt Col Michael Foster-Brown added: “They will be living in the bush and take part in platoon and company exercises, culminating in a big battle group exercise. “It will be very demanding training with a regular British Army battalion with support. “The benefit for us is from a scale point of view – we cannot replicate that size of exercise and the chance to give our soldiers experience of all the other elements of a battle group will be very valuable. The Regiment said, “Askari Thunder training involves more than 1000 infantry troops, with support from engineers, medics, artillery and RAF and Royal Navy helicopters. Update Sept 2nd: The British Army are covering all costs for this, except for the flights from Bermuda to UK and the wages of the Bermuda soldiers. 2 months in Kenya is a great experience. However, in these hard times, is such a trip necessary? The Regiment’s main roles are ceremonial (parades), disaster (mainly hurricane) relief and internal security (mainly riot control). How will two months of “extensive tactical training” in Kenya, by these three soldiers, be of benefit to the Regiment and to Bermuda? I seriously doubt the Kenya training will involve any of the roles the Regiment has. Waste of money, but a classic Dunkley Photo Op. Well they are trying to convert to an all volunteer and more professional army. 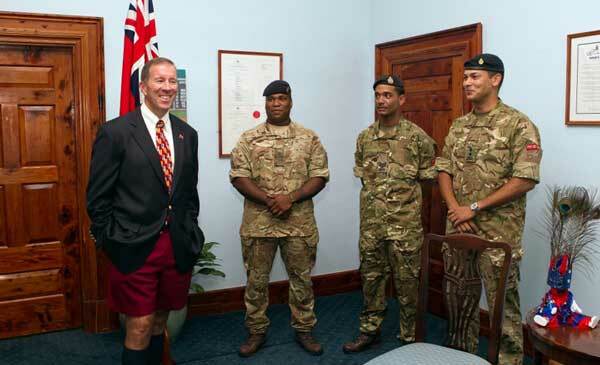 Surprised that some are criticizing despite the fact that these are young Bermudians being groomed to be the future of the regiment and are being supported by the Government. Damed if you do and damned if you don’t I guess. Sometimes it is less about the combat experience and more about the leadership role training, team building and operation. As we are trying to reshape the regiment structure and role, it also exposes new ideas and training practices. It is seldom that the regiment personal get a chance to participate in such a large scaled exercise, so the experience is invaluable. Those going are committed soldiers and will appreciate the opportunity this gives them and take it a chance to enhance their skills and persons and I wish them the best out there. It is a shame that those who criticize this don’t seem to appreciate that these are people who have committed themselves to serving all of us in huge community and should receive our support and well wishes in this venture. I am all for The regiment yes! but with Ebola out of control is it even worth the risk to send them at this time? Africa travel should not be postponed until it is under control ! I ment to say should be postponed!!!!!!!!!!!!!!!!!!!!!!!!!!!!! Have you looked at a map to see just how big Africa is? Kenya is not the Congo and Kenya is thousands of miles away from Liberia. Get a grip. That’s like advising tourists not to come to Bermuda because there’s an outbreak of dysentery in Haiti. FACTOR. YOU BETTER DO YOUR OWN INVESTIGATION INSTEAD OF BEING A REPEATER OF MAINSTREAM MEDIA. Um. You do realize that Africa is a big ‘ol continent right? The distance from kenya to guinea is greater than the distance between new york and california. I guess if Kenya is Congo then I suppose Burundi, Rwanda, Tanzania and Uganda have ceased to exist? Kenya is not Congo. They’re not even adjacent to each other. my mistake Kenya is not Congo! Kenya is Congo…. I’m sorry WHAT? That is like saying Canada is Mexico. Premier, are you for real ….. Kenya !!!!! what the hell are you thinking ? please explain this ridiculous situation..
Why there is an ebola break out want to send them to kenya…….great job! I hope they stay out there, because it will wipe bermuda out in less than a year. Well done guys! Good luck and be alert. Research from Harvard traces the possible origins of the outbreak, amid fears that mutations could hinder treatment of the virus. This little junket will cost us hundreds of thousands. Gee Triangle I would give you the “Dumbest comment of the week” award but it already went to Sebring who actually thought that Kenya was the Congo. And managed to get 13 likes. How will this trip possibly cost the taxpayers hundreds of thousands of dollars. I’m going out on a limb here but math probably was not your best subject. And both you and Sebring support conscription which speaks volumes. where the hell is Sgt.Major Burchall when we need him. Kenya is more than 1600 miles from the Congo. They are at opposite sides of a very large continent. I was thinking the same thing about the Ebola outbreak- who should be venturing to that part of Africa? Bad idea, although it is a different strain of the virus why put these men in harms way? Even though Kenya has closed its border to Ebola patients, who knows what can happen and if infected persons will cross over, too risky. Dont worry about de ebola outbreak they sign there lives to the Queen of England already! The Welsh Guards will have some real fun with these 3 guys! Waste of money which we don’t even have. Our poor children and grandchildren, is this truly the future we want for them? The Ebola outbreak has not spread to Kenya, nor is it likely to as they have recently closed their borders to all travelers from West Africa, where the Ebola is. Kenya is on the east side of Africa for those of you that skipped geography class. Talking about opposite sides of the continent spanning a good 5,000km. Usually when a group of soldiers travel abroad (UK,Canada,etc) for training, they are accompanied by at least one of the many British soldiers” working” at Warwick Camp, who basically go along to add to their resumes’. It is interesting to note, not one will be going to Africa!